We’ve been watching our usual Christmas movies over the last few weeks. 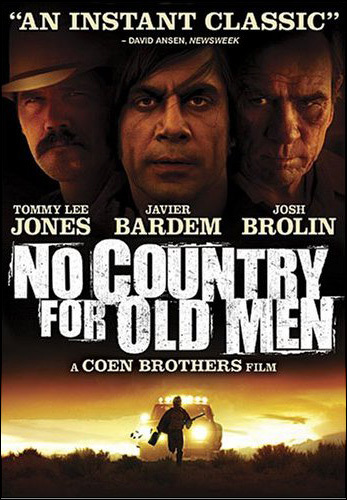 The other night, however, my boys wanted to watch “No Country For Old Men.” I found it the perfect film for Advent. That may sound odd, but I say this because of its absolute lack of sentimentality, its unrelenting portrayal of the true condition of the world, and its hopeful eschatological vision. This is exactly the two-fold character of Advent—truthful reflection on the current state of the world and active hope for the return of the Son of God. The film powerfully depicts the inevitability of evil’s triumph in this world, the inexorable march of death and destruction. It isn’t easy to watch, quite frankly. The Coen brothers based their film on the novel by Cormac McCarthy, who pursues similar themes in a few of his other works. “The Road” and “Blood Meridian” contain the same clear-eyed depiction of the brutality of this world and the inevitable triumph of death and evil. I don’t find these novels completely hopeless, however. Each of them combine this vision of the world with an opened up eschatological horizon. Evil and death triumph in this age, but that’s not the whole story. There’s something more, something beyond. McCarthy’s three novels end with some mention of fire as a symbol of eschatological hope. In the post-apocalyptic work, “The Road,” the father dies while commissioning his son to carry the fire for him. Death wins in this instance, but there’s some kind of hope for the future. In “Blood Meridian,” the Judge embodies the brilliance of evil and triumphs at the novel’s end. In a one-page epilogue, however, McCarthy depicts some sort of mysterious purging fire that opens up an eschatological horizon of judgment. Evil triumphs in this age, but it can’t escape the judgment to come. The same device appears in the final scene of “No Country For Old Men.” The sheriff is eating breakfast with his wife and tells her about the dream he’s had about his father. It was like we was both back in older times and I was on horseback goin’ through the mountains of a night, goin’ through this pass in the mountains. It was cold and there was snow on the ground He rode past me and kept on goin’. Never said nothin’ goin’ by. He just rode on past and he had his blanket wrapped around him and his head down and when he rode past I seen he was carryin’ fire in a horn the way people used to do and I could see the horn from the light inside of it, about the color of the moon. And in the dream I knew that he was goin’ on ahead and that he was fixin’ to make a fire somewhere out there in all that dark and all that cold, and I knew that whenever I got there he’d be there. And then I woke up. Advent trains us to speak truthfully about ourselves and the condition of the world. Disciplined Christian speech resists sentimentality and names evil and sin for what they truly are. And Advent trains us to look ahead and hope for the return of God’s Son to set everything right, renew creation, and reclaim his world for the glory of God. Why Do Christian Children Stay Christian? I first saw No Country for Old Men a few months ago and was so disappointed in the end. Your post, however, has given me a different perspective. It’s helpful to know that fire serves as sort of a symbol of eschatological hope in McCarthy’s novels. This is somewhat ironic as I am preparing to write my thesis on the influence of Jewish apocalyptic in 1 Corinthians 15! Well, I must now give the movie a second viewing–thanks! I hear you, Jason. The first time I saw it, I was shocked at the end and totally disappointed. But talking through it with some friends helped to unpack it, and reading the book brings so much to light. Like other Coen films, subsequent viewings are necessary! Our daughter is 17 and our sons are 15 and almost 13. Hmmm…I am a firm believer in using art – in this case, movies – to help “storify” the Gospel for us. I, myself, have recently taught classes wherein I made use of the movies “Meet Joe Black” and “Second Hand Lions.” (Both movies show how life transforms death. This, I believe, is the type of thing Paul is telling us about atonement in 2 Cor 5:15.) Anyways…Even though I’m a firm believer in using movies in such ways, and even though I’m certain that my 12-year-old son would be all over watching NCFOM, I’m just not sure about him watching such graphic violence. Now that you’ve shown the movie to your kids, are you convinced that it was the right thing to do? I mean, did they handle the violence ok? You don’t have to answer that if you don’t want to.